As the world is seeing an increase in the frequency of natural disasters and millions of victims become displaced from their homes for extended periods of time, Akar Logistics is now offering its popular Personal Comfort Kit™ for these persons. Shelters can be overwhelmed with the immediate needs to provide hygiene products for these persons; to help combat the stress of being displaced, but also the dangers of diseases as well. The Personal Comfort Kit™ comes packed complete with necessary hygiene products and is compact and durable, making them an ideal component to a shelters needs for the victims. The Personal Comfort Kit™ is also ideal for the responding personnel; as they too have hygiene needs that must be met for them to successfully fulfill their mission. These kits have been widely used by DMAT (Disaster Medical Assistance Teams) in the United States. Designed in Desert Camo with durable nylon fabric. These kits come completely packaged with hygiene needs as shown in photo above. It can also be easily carried by the included handle. Includes a multi-function strap, which can be placed over a showerhead, or tree (for use in the field). 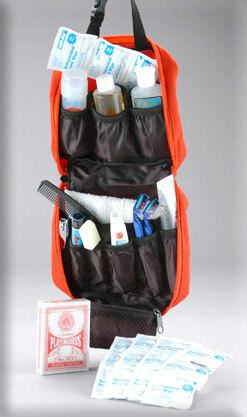 It is lightweight and compact enough to fit in the side pocket of a BDU, ALICE Pack, briefcase or overnight bag.